I guess that you have already heard about the 1987 documentary series that brought Enya’s first solo album. The story goes that the BBC producer Tony McAuley told Roma that they were looking for several “Celtic” composers to write music for their series in the working. Enya and Nicky quickly put together a demo for ‘March of the Celts’ and sent it out. The BBC people loved it so much they hired Enya on the spot to provide music for the entire series and the rest is history. For many years, the documentary was a yeti of sorts, everyone has heard about it but no-one has seen it. 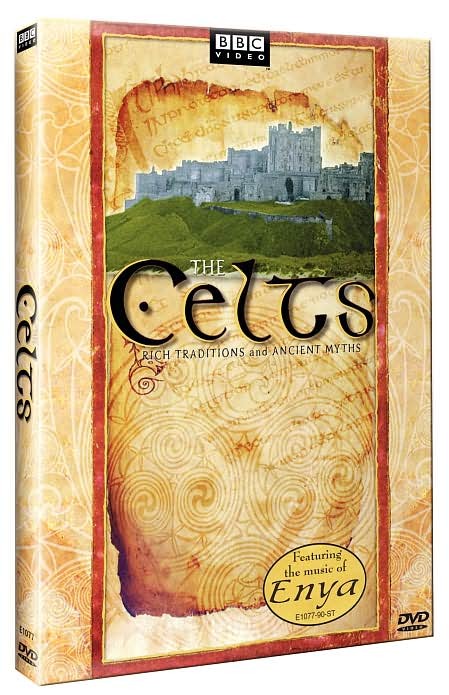 The series was not available on dvd until 17 February 2004 when it got reissued in the US and then in Japan as ‘The Celts – Rich Traditions and Ancient Myths’. Yes, I know, a documentary made by the British public television about European ancestors… However, let’s not complain, there is no problem in getting it from the US and a lot of dvd players are now region-free. But should you put your money out and buy the dvd? To get things straight from the start, this is an educational program made in the 80s. If this is not enough to scare you off, you get a point and you can continue. While the host Frank Delaney seems nice, the topic is interesting and hardly outdated after 25 years, I could not get myself to watch almost six hours of it. After the first episode I skipped straight to Enya videos and special features. I might see the rest on a rainy day but for now I will not judge the documentary itself. I will tell you about the Enya stuff because I know that is what you are interested in anyway. There are two music videos that are part of the episodes. ‘Aldebaran’ features Enya singing the song in the dark. End of story. Luckily, ‘I Want Tomorrow’ ups the game. It actually ups it so much that you might not believe your eyes the first time you see the video. It starts with Enya wearing a wig and associating with a group of homeless people. Her eyes glow. She puts on leather motorcycle gear and goes to a Stonehenge of sorts. A mad scientist with a weird machine causes fire and an electric storm. Enya travels in time. She gets rid of the wig and leather gear in favour of an 80s business girl outfit. She looks out in the distance and then burns a car. Right, she looks at a car and blows it up. WITH HER FINGER. Now, if this isn’t worth your money I don’t know what is. I love this video because it is completely random and makes no sense whatsoever. I suppose that Enya represents a modern day Celtic girl being spellbound by Boadicea but who knows. The dvd set also includes an Enya-focused 1989 episode from Val Doonican’s ‘Homeward Bound’ tv show. Val interviews Enya and her dad, Leo Brennan, and Enya performs ‘On Your Shore’ and ‘Na Laetha Geal M’Óige’ on locations near her hometown, Gweedore. Enya talks about her childhood and inspiration behind several songs on ‘Watermark’, the interview is quite in-depth and brings interesting information. 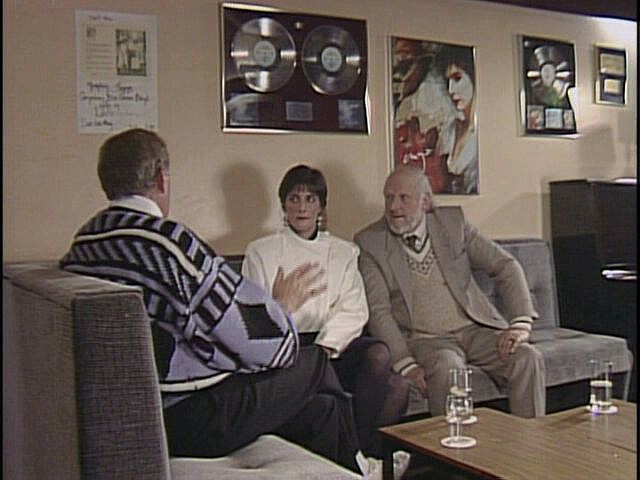 Val Doonican seems genuinely warm and interested in what Enya has to say so I rank this interview much higher than the usual short promo appearances we get to see on tv. Most of these songs were released on Enya’s debut album ‘ENYA’ in 1986 and consequently on its 1993 reissue ‘The Celts’. Others would later be reworked and issued under new titles. ‘Morrighan’ is the Irish part of ‘Pax Deorum’, ‘Untitled (Over Scarecrow)’ is an old version of ‘The Longships’ and ‘Deserted House’ is a piano version of ‘Tempus Vernum’. And of course, the funky ‘Spaghetti Western’ appeared as a b-side on some editions of the 2005 ‘Amarantine’ single. But some of them, such as ‘Severed Head’ and ‘Fairytale II’ can still be heard only here. I am really torn on whether I should recommend this one or not. I bought the dvd because I wanted to see the interview, hear the unreleased songs and own the video. The interview is really very good and it can be fun to hunt for new material once you think that you’ve heard everything but after all, these are just unfinished snippets scattered over six hours of television. I think it really depends on how much you are interested in Celtic history (a bit), how much of an Enya completist you are (kind of) and how much you enjoy watching Enya setting things on fire (a lot). For 800 years, a proud, vibrant, richly imaginative warrior people swept ruthlessly across Europe. The ancient Greeks called them “Keltoi” and honored them as one of the great barbarian races. Follow their fascinating story from their earliest roots 2,500 years ago through the flowering of their unique culture and their enduring heritage today, enhanced with stunning reconstructions of iron-age villages, dramatizations of major historical events and visits to modern Celtic lands. This fascinating look back at the legends and legacy of the Celtic heritage is underscored by the hauntingly beautiful music of Enya. Thanks so much Enya sk for the excellent info on The Celts DVD, especially Val Doonigan’s ‘Homeward Bound’ episode featuring Enya from (1989). Thanks to your info, I was able to locate recordings of the programme on you tube. Great! 1) ‘Aldabaran’ as featured in the BBC’s ‘The Celts Rich Traditions & Ancient Myths’. 2) ‘I Want Tomorrow’ as featured in the BBC’s ‘The Celts Rich Traditions & Ancient Myths’. 3) ‘Boadicea’ (in Studio) with remastered music uploaded to You Tube by “Fallanraptor”. 4) Val Doonican’s ‘Homeward Bound’ (minus the Daniel O’Donnell interview) from the BBC, 1989.